Each school day I send fun lunches with my kids. It’s really a bribe to get them happy about waking up at 6:00am. Occasionally the lunches are so cool that the kids say they “Love School” in the morning. I’m generally happy if the lunches distract them enough to stop the “I’m tooooo tiiiiired” whining. This week I made more rice balls and added some purple carrots from Greenling. The first lunch was a heart rice ball with beans and a little chick. For instructions on making rice balls, go HERE. For this one, I used a Heart Mold . Under the rice ball I put some black beans. On top of the rice ball I made a little chick decoration with our new Chick Punch . 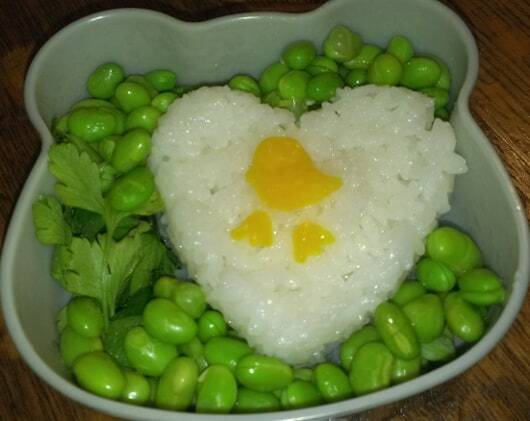 A added edamame and some parsley to the bottom of the Panda Bento Box . My kids once grew parsley and now insist on eating it as a snack. Seems like I should let them grow every type of vegetable to get this same response. Variations of this lunch were made all week but when our Greenling Local Box arrived, the purple carrots took center stage. 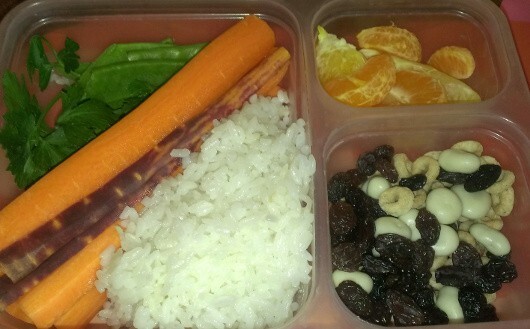 This lunch has rice, beans, parsley, oranges and purple and orange carrots. It also has my signature trail mix (aka find every little thing in the pantry, like raisins, Cheerios and yogurt bites, and put them together). Overall, the lunches were a success. No one knocked me over as they excitedly leaped out of bed and got ready for school. But, I didn’t have to fireman carry any to the car, so I’m calling it a good week.